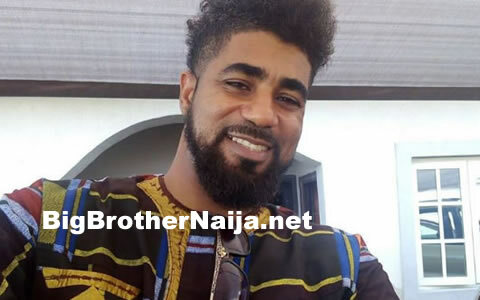 Here are the official voting results for Big Brother Naija 2017 week 6. The final results reveal that Kemen received the least percentage of votes and was going to be Evicted anyway. Well week 6’s voting results indicate that Efe received the highest percentage of votes with 39.9%, he was followed by TBoss with 14.4%. 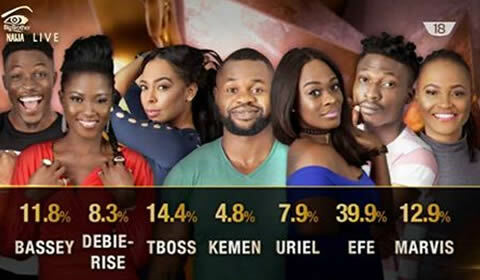 Marvis came third with 12.9%, followed by Bassey with 11.8%, followed by Debie-Rise with 8.3%, followed by Uriel with 7.9% and lastly Kemen with 4.8%. But because Kemen had already been disqualified from the BBNaija house, Uriel was instead evicted because she had the second least percentage of votes. Share this with your friends and remember you share your views with us by leaving a comment in one of our comment boxes below. Writer the last one from 6 march time 8:53, i want to ask God why he created morons like you, why are you sooo stupid and vulgar? You behave as if tboss is your wife. Control your anger idiot, you can't reason anymore. The is one thing now the devil use our emotions. Be careful bigbrother is one of devil platform. You fall for it. Pray before become victim.